Powered with a Battery Operated pulse system to reduce friction while shaving, the Italian designed handle of SUPER-MAX POWER DISPOSABLE™ gives you comfortable handling. The unique Control-Fin gives you greater control while you shave and the Nature Strip eliminates skin irritation. World’s first 4-blade disposable razor. Experience the power of a closer, cleaner and smoother shave with SUPER-MAX SMX4®. A unique Italian design handle equipped with a Control-Fin, SUPER-MAX SMX4® gives you a great grip and absolute control while shaving. Your ultimate solution to a fresher, cleaner shave!!! 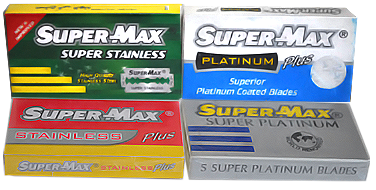 Powered with 3-blade technology, SUPER-MAX ULTIMATE™ 3 is your ultimate solution to a refreshing, clean shave. Enhanced grip with a unique Italian design handle, SUPER-MAX ULTIMATE™ 3 glides along the contours of your face, giving you a smoother, bump-free shave. An innovation in shaving, with SUPER-MAX ULTIMATE™ 3 PRO-TECT you can now protect your skin as you shave. The Anti-septic Nature Strip™ enriched with Propolis safeguards your skin from infection and the Anti-bacterial elastomer handle keeps your razor germ free. Experience a clean shave in every sense of the word. An innovation in shaving, now give your skin a wake-up call every time you shave. With a Nature Strip™ enriched with Menthol extracts, a unique Italian design handle, and the power of 3-Blade technology, SUPER-MAX ULTIMATE™ 3 RE-FRESH gives you a smoother, fresher shave. Now that’s what we call 3 Blade Innovation with absolute control. COMFORTGRIP™ 3 comes with a 3 blade advantage for a closer shave. Its pivoting head glides along the contours of your face and makes shaving a smoother experience. The classic two blade razor, COMFORTGRIP™ 2 comes with twin ionized blades which give you a smoother shave. Its Lubrication strip with Vitamin E and Aloe Vera Extracts soothes and moisturizes your skin as you shave. A world class twin disposable razor with a specially designed long handle that provides for a better grip ensuring precise handling, control and comfort while shaving. Features the Super-Max Nature Strip™ enriched with Tea Tree Oil that has antiseptic properties and reduces skin irritation. Four Blade Technology for a closer, smoother shave. Featuring the Lubra Strip which soothes the skin and a Guard Bar for enhanced shaving performance, it’s ergonomically designed handle gives you greater control and precision while shaving. The click and lock system enables easy use and cartridge change. Triple Blade Shaving System Razor with unique click and lock technology. The 3 Blade technology gives you a smoother and closer shave and the Aloe Vera Strip reduces skin irritation. The extra long handle gives you enhanced control and pivoting head adapts to the contours of your face making shaving a comfortable experience. Offering a great value for your every day shave, the pack comes with a double-edge razor which uses the new “Click and Lock” Technology. Triple Blade Technology for a close, smooth shave. Reduces skin irritation by curtailing the need for repeated strokes. The pivoting head adapts to the contours of your face giving you a closer shave and the ergonomically designed handle comes with a click and lock system that makes it easy to use and change cartridges.